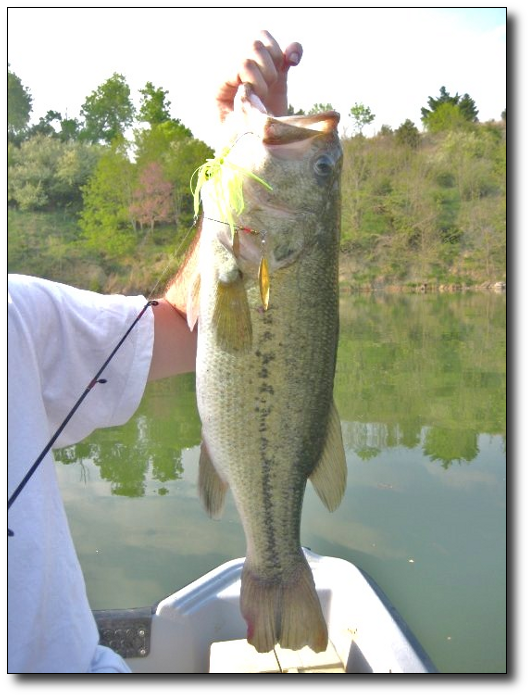 This Bass was caught around 4 in the afternoon. My son Aaron, who is a tag along member, actually caught the fish. We didn't have a scale so we couldn't weigh her, but was able to measure and she was 24 inches long. 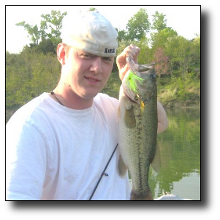 The lure was top water yellow skirted twin blade spinner bait. The Bass was laying about 2 feet off the bank on a rocky/sandy ledge. I assume by the looks of her tale that she was preparing a bed. It took about a minute to land her (seemed like eternity) but she finally wore out and gave up. We took pictures and sent her on her way. Hopefully, she'll produce off-spring like herself. I hooked onto one myself shortly after that. I think it may have been about that size. The only problem was I was fishing for Crappie with a rod rigged for crappie. I was using a minnow and didn't have the hook tied on correctly. The fish grabbed it (again about 2 feet off-shore) took off running with my drag squealing I was able to bring her in close enough to the boat to get a look, but as soon as she saw us she took off under the boat and then "SNAP!" broke the line right where I had tied the hook.....lesson learned. We caught quite a few smaller Bass and around 30 Crappie, but only one Crappie of any size. I'm glad that members and guests, who have caught trophy fish in the past, released them back into the pits/ponds. That way everyone has the possibility of experiencing the thrill of hooking into such a powerful fish.